The men's and ladies Country Marlboro. 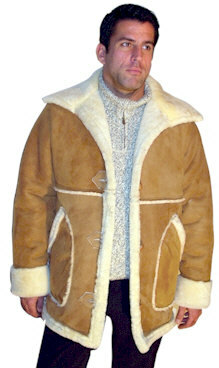 This is a basic Marlboro sheepskin coat that is an easy, comfortable fit. This is not a fitted coat, which means that it will be very comfortable and it won't be restricting to wear sweaters or bulky clothes underneath. Available in color shown or stony tan. To see stony tan color, see the men's Open Seam Coat.